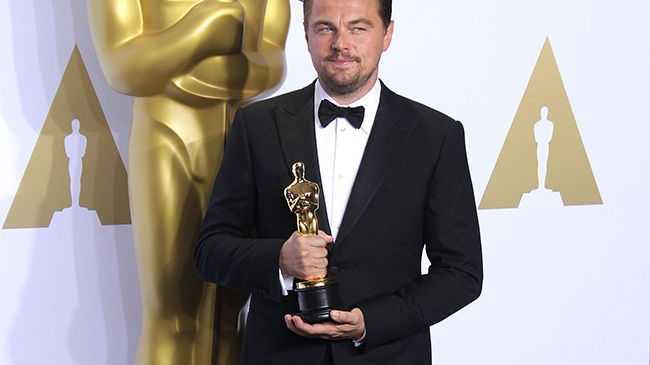 LEONARDO DiCaprio's Oscar win set a new record on Twitter. The 41-year-old actor picked up the Best Actor prize for his role in 'The Revenant' at last night's (28.02.16) ceremony and the moments after his name was read out as the winner generated over 440,000 tweets per minute, making it the most-tweeted minute of an Oscars telecast ever. The figure smashes the previous record, which was set in 2014 when then-host Ellen DeGeneres tweeted a star-studded selfie. However, Ellen's post is likely to retain the title of most-tweeted Oscars moment ever, as it has been retweeted a staggering 3.34 million times to date. Among those tweeting about Leonardo - who took home his first Oscar, despite it being his sixth nomination - were stars including Kanye West, Oprah Winfrey, and Ellen herself. Kanye posted: "Finally!!! Our guy!!! We're so so happy for Leo!!! (sic)"
Oprah tweeted: "It Happppppened!! bravo Leo! standing O in my p.j's. #Oscars (sic)"
And Ellen wrote: "He did it! He really did it! @LeoDiCaprio, I love you #Oscars (sic)"
Actresses Elizabeth Banks and Jessica Chastain were also thrilled for the star. Elizabeth tweeted: "Leo is a class act. Congrats. #Oscars"
And Jessica simply wrote: "Its about time #Leo"